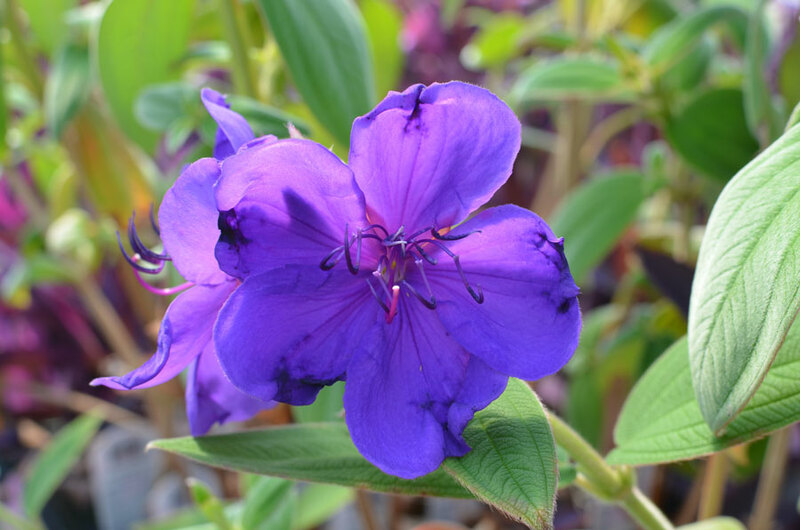 Tibouchina is a wonderful, colourful accent plant that will give a tropical flair to your containers. Large, royal purple blossoms create a spectacular sight when in full bloom. 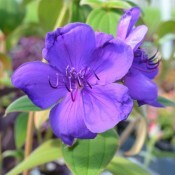 Tibouchina is great as a specimen or as an accent in a mixed container. It can be grown into a rounded shrub or trained into a small tree. The dark green velvety leaves provide an attractive backdrop for red or orange flowers. Latin Princess is vigorous grower that blooms constantly all summer. The dark green, velvety leaves may have red margins. Rounded, red-tinged buds open to reveal royal cobalt blue flowers in late spring to late fall. The vivid large blooms are self-cleaning. A stunning centrepiece in an established border or in large containers.